Spotted Owlet is small owlet which seen all over the India. It is the owlet we know from our childhood. They used to perch on TV antenna on our terrace. It is very small and make lots of noise at night. They mostly seen in group. In my campus six to seven owlets used to hunting in street light. We heard their call almost every night. 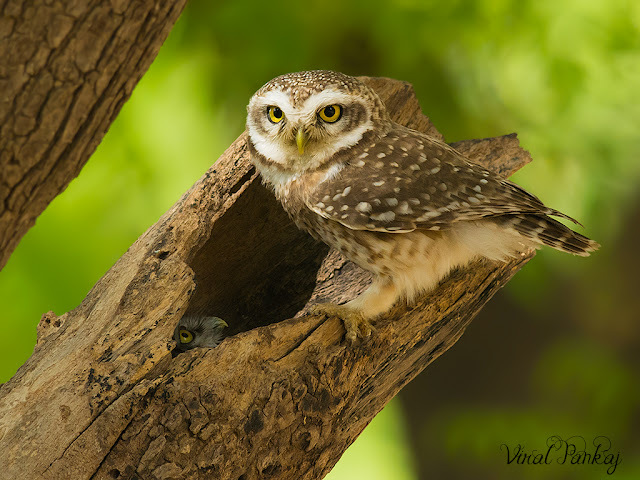 It is a one of the owlet clicked maximum with many pose. We went to Rani Ki Vav in search of Black-rumped Flameback. Many time we saw Black-rumped Flameback there. As we were searching for the Black-rumped Flameback we saw Spotted Owlet on Neem tree. We saw many time Spotted Owlet at that place. They are staying there. We were just delighted to observe the way Spotted Owlet coming out from their nest hole, it was beautiful. Enjoy lot there on the 1st May 2015.